We had traveled thousands of miles to be at this very spot. Atop the Riffelhorn, high above the Gorner Glacier, our gazes fixed upon the peaks and snowy ridges of the high mountains. For many, these spiny backs and snow clad pinnacles merely mark the border of Italy and Switzerland. But for us, this wild landscape spread before us was the beginning of an adventure. To our left was the immense Monte Rosa massif, the tallest in Switzerland, robed in snowy grandeur. In the center was the impressive north face of the Breithorn with its hanging glaciers and seemingly impassable ramparts. And to the right, the imposing Matterhorn – our objective for the week. I am relying on friend and guide Jonathon Spitzer to help me acclimatize and sharpen my skills to ascend this incredible stone monolith. Having summited 5 times, Jonathon’s experience will be invaluable on this adventure; one filled with wonder and accomplishment, whiteout conditions, 50 mph sustained winds, a sudden summer storm, an accident high on the peak, and mojitos at 11,000 feet. Training is what brought us to the Riffelhorn’s modest summit where its south face has terrain much like the Matterhorn. We climbed the 8 short 5.7 pitches in mountaineering boots instead of rock shoes, as mixed routes of snow, rock, and ice are climbed in boots and oftentimes in crampons. After a little lunch, we descended to the west ridge, rigged with fixed ropes similar to those on the steepest sections of the Matterhorn. These ropes are unlike any I’ve encountered in the U.S. They are as thick as a man’s forearm, like the ropes used to tie up a large ship. My first attempt left me flopping around a bit, smashing my knees into the rocks. But eventually I got into the rhythm and technique, climbing the rock with my feet and one hand, the other on the rope for balance. By the third time I was getting the hang of it, but knew this would be my personal challenge to overcome to reach the top of the Matterhorn. 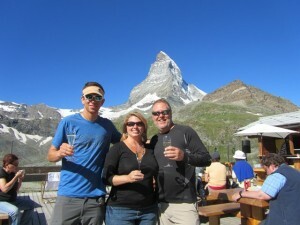 The next morning we left the beautiful village of Zermatt for 3 days of climbing on the Italian side of the range. We’d be staying in the Guide della Val d’Ayas hut above the slopes of the Aosta valley. 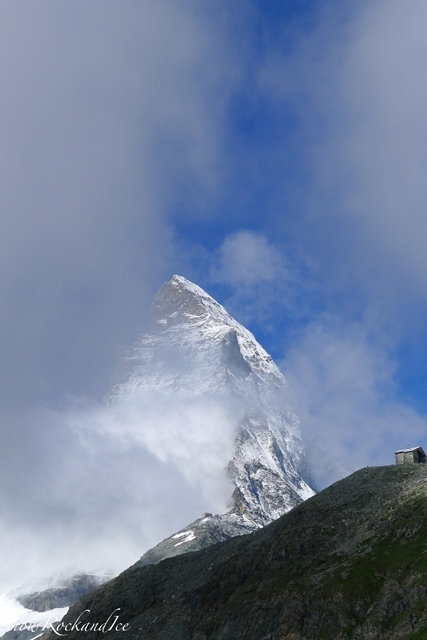 At just over 11,000 feet, the overnight in the hut and climbing several peaks above the 4,000 meter threshold would help my body to acclimatize to conquer the 4,478 meters (14,692 feet) Matterhorn. With full packs and good weather, we boarded the Klein Matterhorn lift, bringing us effortlessly up to 12,740 feet and the “as advertised” glacier palace. Views of the Matterhorn from its most photographed side really got my engine going. 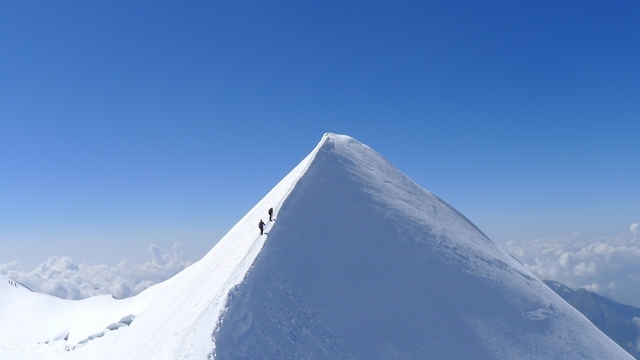 Since I was a young boy, I had memorized its perfect ridges and the way its summit block seems to look down, peering over its immense east face like a monarch over its subjects. It was in perfect condition, dry with very little snow, and appearing even taller than my boyhood imagination had dreamed. We had set out for two 4,000 meter peaks; twins in fact, Pollux and Castor, named from Greek mythology and known by the locals as Zwillinge (the twins). We roped up and began a long traverse over the Breithorn Plateau, a wide expansive glacier on the southern Italian slopes of the Breithorn massif. The first day at altitude is always a ball buster. You move slowly, huff and puff a lot, and are reminded that much of mountaineering is having a certain comfort with suffering. So far this trip was right on schedule! It was a beautiful day hiking along the glacier, passing numerous crevasses, traversing above and below them. After a few hours we were at the Zwillingsjoch, the saddle between Pollux and Castor, staring up at the twins with snow piled on them like sculpted dollops of meringue. Pollux was first. The route took us up a rocky ridge, winding in and around, up and through rock notches, towers, and eventually to a steep rocky buttress. 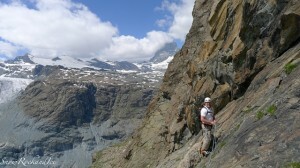 The final buttress was very steep and, as on the Matterhorn, rigged with fixed ropes. There were three ropes. The first fairly short, leading to the second, which traversed a rock wall, polished by time, interrupted only by a series of little one-inch ledges. Using just the front points of my crampons on these tiny footholds, and working my way across the polished rock, made me appreciate the security of the fixed rope even more. These precarious ledges marked by countless crampons scratches from generations of alpinists, led the way to the last fixed rope. The final section was fairly long, ascending a steep, narrow chimney until I emerged on the top. 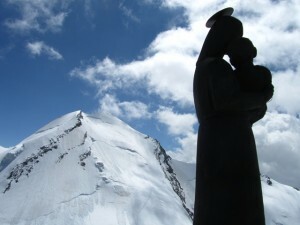 There I was greeted by a modern statue of the Madonna and Child and nature’s incredibly inspiring views. From the top of the buttress, the final snow arête leading to the summit presented itself glistening in sunlight and clear skies. It was an easy few minutes to the top. Easy enough to take in the incredible views of the range along the way and catch glimpses of tomorrow’s slightly taller objective, Castor. It was all downhill as we made our way to the Guide della Val d’Ayas hut. The mountain hut system spread throughout the Alps allows for lighter packs and offer comforts not usually found in the mountains like a filling hot dinner, a light breakfast (usually old crusty bread, some congealed jams, and coffee), water, snacks, beer, wine, and overpriced postcards. Upon arrival, the harnesses and crampons come off as you spy a sunny place to dry off snowy equipment. Crocs are provided to give feet a little downtime from hours spent in mountaineering boots and, although these huts are remote, the night will be spent with anywhere between 60-120 other mountaineers all packed in like sardines. By midday, the hut is full with climbers hiking up from the Aosta valley or returning from successes/failures above. It gets noisier with each climbing party that arrives and solitude becomes difficult to find. Many huts have Wi-Fi now, leading to a new irony as climbers sit at tables peering into small devices, checking facebook and email, texting and Skypeing the world far below. This connection to the “real” world is in direct opposition with why I go to these remote spots and why you didn’t get a text from the summit. An hour before or after dinner is a quiet time outside the hut, time to grab the camera, find a peaceful spot, and just bask in the peace. Watch the icefall as it tumbles down the valley and enjoy the show of light and color that happens at dusk. 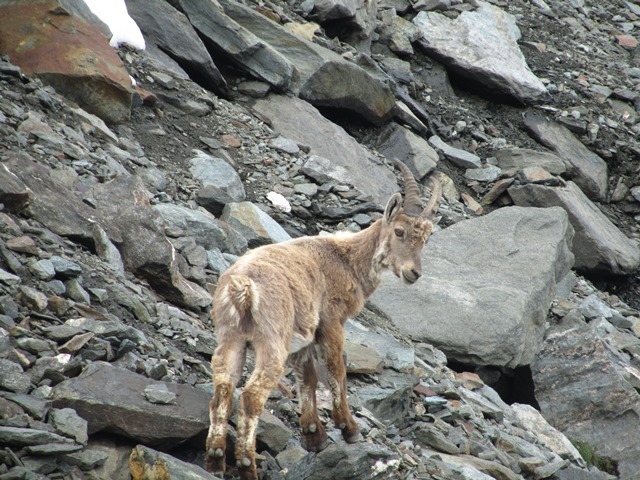 I spotted a young male ibex on a rocky perch who seemed as interested in me as I was in him. His curiosity brought him closer as he posed for a few photos and then found a comfortable spot to relax. I did likewise, and we shared an hour of contemplation admiring the beauty and solitude of our surroundings. At daybreak we ascended 1,000 feet of steep snow to the foot of Castor. From the base we admired its sheer, snow covered face; the route zigzagging up 2,000 feet and crossing 2 pronounced bergschrunds. The steepest of the two required us to climb directly through it. After a few very thought provoking final steps, we were on a rocky ridge looking at a breathtakingly slender snow ridge. It was easily the star of the climb; exposed, airy, elegant and single file! It’s narrow and dangerous enough that climbers wait in queue for their turn to ascend, with just room enough for each footprint, and not the side by side kind. Climbers are very vulnerable on this type of terrain as the only way to stop a fall is for the other climber to jump off the other side. Ridges like this require a great deal of concentration as you place each and every step. I am reminded that no matter how much I want to look out from my personal perch, I have to focus only on my feet until the ridge widens. Alright, so I did pause and take a very quick look – it was amazing! After a quick descent, Jonathon and I decided it would be good training to re-ascend the mixed terrain past the fixed ropes on Pollux. What took us over an hour the previous day, with better acclimatization, familiarity of the route, and better technique, now took us only 30 minutes. By midday we were heading back down to the hut for another overnight before returning to Zermatt. A new chef, and fresh supplies, had arrived by helicopter, and what had seemed a friendly, fairly quiet place the day before had been transformed into a full on party. The 6 guardians who manage the d’Ayas hut have been together for many years, and have become a family; doling out beds to climbers and offering Italian hospitality by the bucket-fulls. Tonight the hut was overbooked, so they needed two sittings for dinner. We were lingering after a full and delicious dinner when Ken, a friendly Dartanian lookalike complete with moustache, asked if we would be willing to relocate to allow the next round of dinner. He said, with a smile, that our kindness would be rewarded at the bar. How could we refuse? After a few minutes the extremely personable Ken gave us each a shot of genepi, an alpine liquor, as he sipped on an Aperol spritz behind the bar, keeping an extra one in the kitchen just in case. With a 4:30 AM departure looming, most climbers went to bed early. We opted to stay up later. Bad weather was moving in and we decided it best to skip our planned Breithorn half traverse and make tomorrow a leisurely day back down to Zermatt. For some reason the guardians took a real liking to Jonathon and I and as the hall cleared out, Ken and the Chef motioned for us to join them in the kitchen. Not wishing to create an international incident by declining Italian hospitality – we obliged. They offered us a healthy pour of grappa. When that was finished they got the bottle of “good” grappa, only for special times. Somehow even with a mixture of Italian, French, German, and English around the small table we all understood what really mattered: a shared love of friendship, the mountains, and the unique surroundings of a special hut in the Alps. Conversation about a trip to Cuba eventually led to “Would you like to have a Mojito?” In a matter of seconds, fresh mint, from Chef’s garden in the valley, and sugar were being muddled while Jack scampered out to the glacier for ice, and another searched for straws. Mojitos at 11,000 feet, a moment of hospitality, and new friends I will never forget. Priceless! As we went to bed, it was apparent that the party would continue through breakfast. It did. Ours was the only table set for breakfast with a bottle of grappa on one side and a dark frightful looking liquor on the other. We opted for coffee. Knowing our weather would deteriorate as the day progressed, we started making our way up the slopes toward the Verra Glacier and the Klein Matterhorn lift station. It didn’t take long for the weather to disintegrate into a full on whiteout. Once we reached the plateau, we were abruptly slapped by 50 mph sustained winds. We were thankful for the GPS coordinates we had plotted days earlier because the path was now riddled with footprints leading off in every direction. Whatever side faced the wind was building with thick ice while the other was bone dry. The Klein Matterhorn lift is actually a series of 5 lifts, and with 50 mph winds we knew that the chance of the lift running in this weather was slim at best – we were right. It was completely shut down with just a few passages in the abandoned hallways open for refuge. We shoveled in a quick lunch in the unlit hallways under the ironically funny banner “World’s Highest Glacier Palace” and contemplated our options. Our only viable option was to start descending the winter ski slopes, staying close to the boundary markings for navigation, and hope that the next lift station might be running. 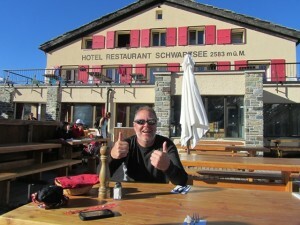 That next station was another 3,000 feet below, but it would be better than descending the entire 7,500 feet to Zermatt! We moved fast into the teeth of the wind and after an hour or so got below the clouds to where we could see the valley, and what a welcome sight it was. Further down, the way became very circuitous as we had to find a path in and around the many runnels of fast flowing water, oftentimes postholing up to our knees. Fairly weary from the extra 3,000 feet, whiteouts, wind, and water, we neared the Trockener Steg station and were met by tourists who asked if we could take their picture. Seeing their flip flops and light jackets, we smiled knowing that the lift was open. Tuesday morning I awoke to clouds and drizzle. Not promising, but it was improving. 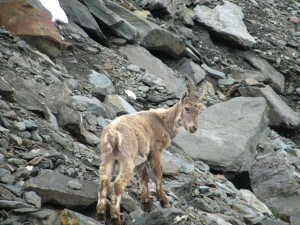 We took the lift and hiked 2 hours up to the Hörnli Hut situated 4,000 feet below the summit. Jonathon decided it would be a good idea to preview the route we would climb in the dark the following morning. This would give me a chance to get comfortable with the terrain and for us to see just how bad the conditions might be. From our new vantage point, we could see there was way more snow than we had feared. Snow and ice on the route means slippery conditions, and ‘easy” terrain that is typically climbed simultaneously now calls for more belays and slower progress. We climbed up past several giant towers and it wasn’t long before we were the highest anyone had been on the mountain since the storm. We had hoped that with a full day of sun the route would melt out somewhat, but it was sure to be dicey on the upper mountain. After seeing the route firsthand and begging, unsuccessfully, for a Thursday hut booking, it was decided. Wednesday, although not great, was our only opportunity. The weather report was good, with little chance of afternoon thunderstorms giving us more time to climb. Jonathon said it would be like climbing in Alaska and gave us little more than 10% chance of summiting. Summit days on the Matterhorn are unlike any other you can imagine. The hut abruptly wakes when the guardian turns on ALL the lights at 3:30 AM. Teams sit together at breakfast with boots, harnesses, helmets and headlamps in place, and partake of a meager breakfast, eating mostly in silence for the full 15 minutes. At 3:45 AM teams get in a queue determined by seniority and history. The Swiss guides at the front, with the most senior guide in the lead, and working its pecking order to the back of the line ending with non-guided parties. We stand in queue, tied into the rope, eating the last of a power bar and awaiting the ticking of the clock. At precisely, 3:50 AM the door opens, you get your first full blast of the alpine wind from the ridge, and then the run to the fixed ropes begins. Yes, run! The goal is to not be at the front or the back of the pack, but in the middle. We had 100 + climbers ready to tackle the route, and for the first 30-60 minutes it was a bit unnerving as parties juggled for their placement, climbing around, and through, slower climbers until fitness and conditions spread us out. The conditions were very icy and slick requiring a slower pace than usual and with 4,000 feet to ascend, it wasn’t looking promising. After a little more than an hour, groups started turning back and it seemed with each additional hour more and more climbers gave up the challenge. The Solvay hut, an emergency shelter, is considered a halfway point. It’s also a favorite spot to drop your pack and have a quick breather before continuing on. The Solvay sits 2,348 feet above the Hörnli hut and while there is only 1,558 feet left of climbing, the steepness and complexity of what lies above makes this a good halfway point. The Moseley slabs, steep climbing above and below the Solvay, are typically climbed in boots, but with the icy conditions, we put on our crampons an hour below the Solvay. While crampons do give better footing, they make movement slower and rock climbing harder. With good conditions you don’t usually find snow until the shoulder. Not today. At the Solvay, we pretty much decided that our chance of summiting in these conditions was next to nil, and that this would be a likely place to turn around. It seemed prudence would be the victor today. As I was contemplating that, Jonathon starting climbing the upper Moseley slab, mumbled something to me as the rope went tight. So we climbed on. Soon we were just below the shoulder. From there we saw the fixed ropes up the summit block and the snow slope leading to the summit. Surrounded by perfect, sunny weather and bluebird skies, we decided it’s going to be slow with these conditions, but let’s just keep moving up. Soon we had reached the red tower and were on the shoulder where the steepness relents for a few minutes. From there I could see several parties on the summit block ascending the fixed ropes and I knew that we were going to make it. 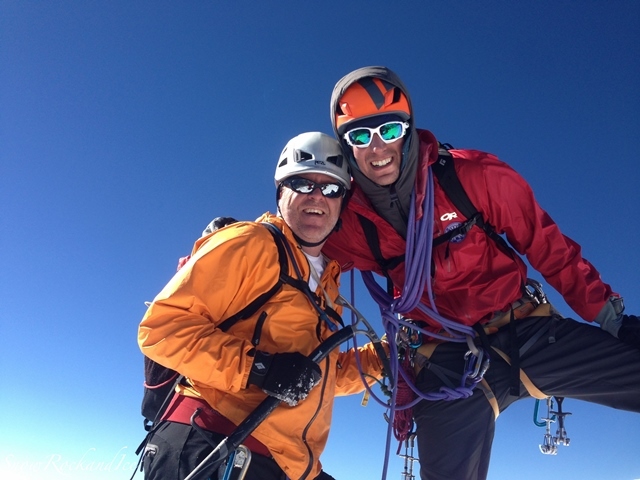 Fueled with adrenaline from the closeness of the summit, the fixed ropes went fairly easily. Quickly moving from one anchor to the next, gaining my rhythm, and in no time I was at the final rope. The last section is slightly overhanging, but with a few more grunts than usual, and with a tight rope from above, I was at the belay with Jonathon. We grabbed our axes and began ascending the final snow and ice slope. It was nearing 60 degrees and had very unstable snow. Some sections were solid ice that we could front point up and in other places the snow was like walking in sugar. Climbing up this snow face, I looked between my legs and saw the valley floor thousands of feet below and was reminded just how steep and exposed this is – not a good place to fall! Each foot and each ice ax placement becomes the single focus, as you slowly inch your way up to the next belay station, then I belay Jonathon as he climbs the next pitch and our dance continues. Once above the last belay station there was only another hundred feet or so until we reached the narrow and spectacular summit ridge. Perhaps it was the incredible amount of effort it took to reach this spot, or the awe inspiring views, or just the simple joy of placing one more foot in front of the other, but these last steps meant so much more. We had the Swiss summit entirely to ourselves. It was 9:00 AM. 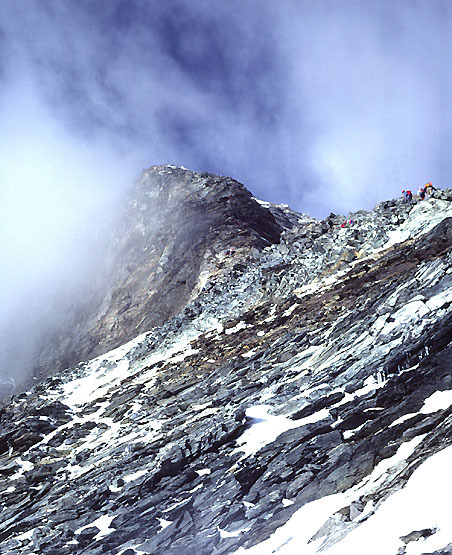 We had overcome difficult climbing conditions and were among only 22 teams out of 100+ that made it that day. This was a culmination of a great accomplishment, a lifelong dream. To climb a difficult iconic mountain like this, in these conditions, means even more. 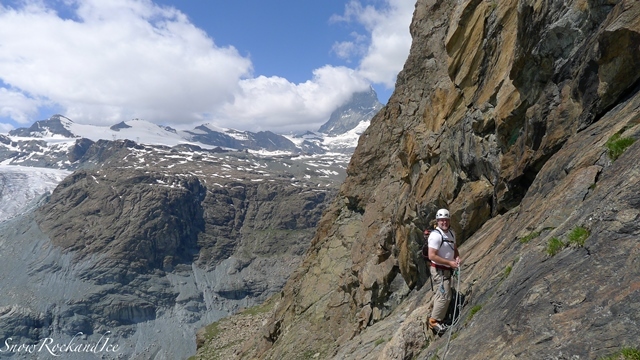 For three climbing trips in the French Alps, every summit has included a look on the horizon for the unmistakable crooked finger of the Matterhorn. Now, standing at the apex and looking toward the other peaks I’ve climbed, I am struck by the incredible fullness of life the mountains give me. 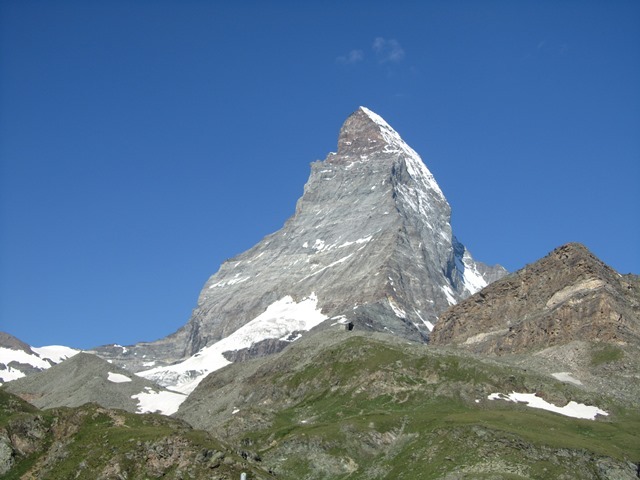 There are 2 summits on the Matterhorn, the Swiss, the tallest, and the Italian linked by an enormously narrow ridge. 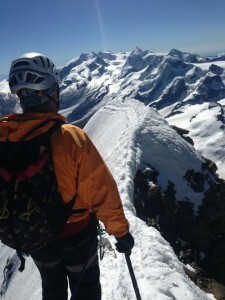 As we took our summit photos, shook hands, and reveled in our success we watched another team reach the Italian summit. It looks so close, but requires another 30 minute traverse. Seeing that the recent storm had swept clean the old boot path between the summits, both teams were quite happy on their own perches and chose against the frightful act of placing new steps in such rarified air. Summiting a mountain is indescribable, but it is also only halfway. Knowing this, our time on the summit was brief and we began our descent. We were staying at the Schwarzsee Hotel that evening, so 6,200 feet needed to be covered before the celebration could begin. The upper snow slopes were pretty treacherous to downclimb and we were happy when we were at the top of the fixed ropes. From there Jonathon could lower me, and we moved quickly down the summit block. 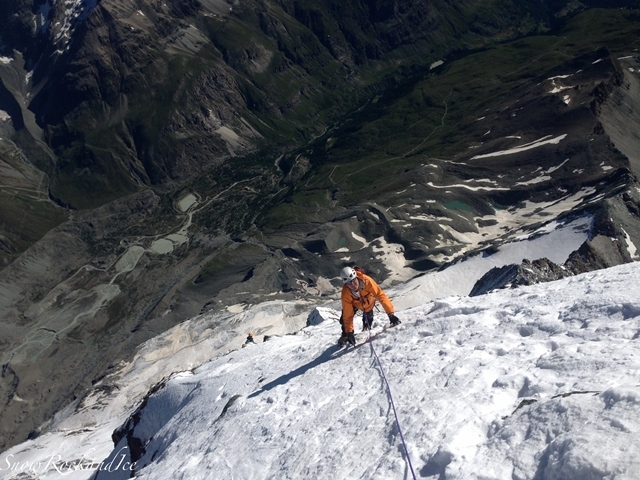 On some mountains a lot of the terrain can be rappelled, but on the Matterhorn most of the route is downclimbed; much of it facing out. As we approached the red tower, I was downclimbing a very steep, awkward section. My right crampon slipped when a patch of ice shattered. This sudden movement, propelled by a little gravity, drove my back crampon point deeply into my left calf muscle. I pulled it out as soon as it happened and managed to get down to a fairly large snow ledge. Jonathon was not far behind and asked if I was bleeding, “Oh yeah, I am definitely bleeding,” I said looking down at the blood already gathering on the snow. We had another 3,000 feet just get back to the hut and in these situations there is only one real choice, just keep moving. I popped 2 ibuprofen and we kept moving. A number of hours later we reached the Hörnli hut and had a chance to take a break and refuel before the final 2 hours to the Schwarzsee Hotel. It felt great knowing the most treacherous part that remained was going down the tourist trail. I had a chance to check my wound and clean it out as best I could. It looked pretty bad and elicited quite a response from American guides and climbers nearby, prompting a sharing of scars and stories that went on for some time. The Schwarzsee Hotel is an amazing place situated in one of the most beautiful places on earth. 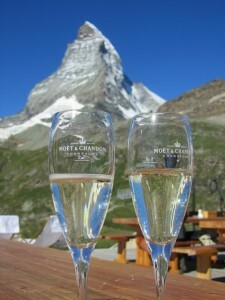 It offers a panoramic view of all of the high mountains and a perfect view of Switzerland’s most photographed peak. It has a welcoming atmosphere made even more so this particular day by the smiling face of Michelle who had come up from Zermatt to welcome us back. Seeing the most important person in your life after such an experience makes celebrating all that much sweeter. After all, the next day was our 26th Wedding Anniversary, and spending it together watching the sunset bathe the Matterhorn in oranges and pinks, with a glass of champagne, was the perfect end to this chapter. Many thanks to Jonathon, a good friend and an enormously talented mountain guide. Thank you also for allowing me to share so many of your beautiful photographs from our trip. Without his help, encouragement, and talent these climbs would not have been possible. If you are planning a future adventure, I can’t recommend Jonathon highly enough. Please visit his site. Jonathon grew up in the Northwest learning to hike, climb and ski in the Cascades Mountains of Washington State. His passion for the outdoors started at a young age, when he learned to ski at 3 years old. With his strong passion for the outdoors, Jonathon made his way to Western State College of Colorado where he received a B.A. in Recreation and Business Administration. These days Jonathon has turned his hobby into his profession, splitting his time guiding between Washington, Alaska, Utah, Nevada, and Europe. 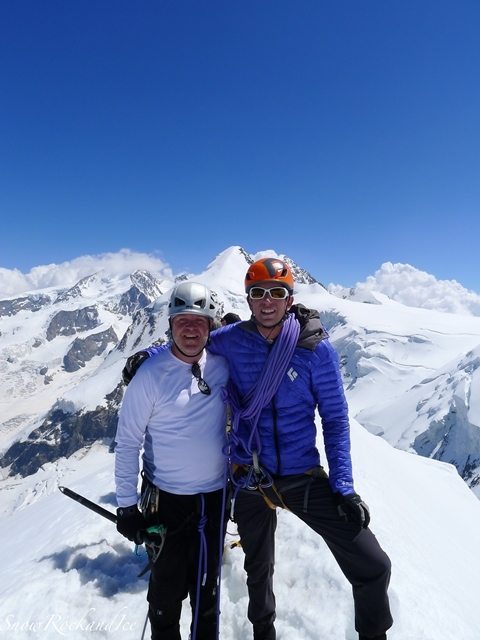 After spending four years completing the American Mountain Guide Association (AMGA/IFMGA) training program, Jonathon passed his final exam in the fall of 2009, becoming one of the youngest Americans to be fully certified in all three disciplines (rock, alpine and ski). With guided trips to the Ecuador volcanoes; Denali, Alaska; Mt. 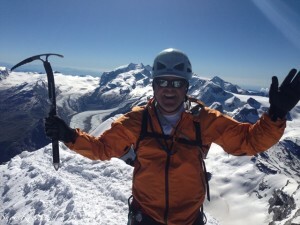 Waddington, British Columbia; the French and Swiss Alps, along with various other places in North and South America, Jonathon has had significant expedition climbing experience. He is also a technically experienced climber completing two ascents of El Capitan in Yosemite National Park, various desert towers in Moab, Utah, as well as challenging alpine routes in Alaska. Jonathon currently works with many leading guide services today including: Alpine Ascents International, Mont Blanc Guides, Utah Mountain Adventures, Mountain Madness, American Alpine Institute, and Ruby Mountain Helicopter Skiing.